“Now I rejoice in my sufferings for your sake, and in my flesh I complete what is lacking in Christ’s afflictions for the sake of his body, that is, the church” (Colossians 1:24). Redemptive suffering. It is that mysterious but incredible reality that the suffering God allows into our lives, when accepted and lived with trust in His Love for us, become an actual participation in the sufferings of the Crucified, allowing us to be formed more truly His image – the very goal of our Faith! And, as Paul said above, because we are “members of one another” (Rom.12:5; Eph.5:25), this grace is of benefit not just to us, but to the entire Body. This teaching, far from casting aspersions on the efficacy of Jesus’ sacrifice, proclaims its superabundance. We believe that His sacrifice redeems us so profoundly that it transforms us from mere creatures of God into sons and daughters. It transforms us into cells of Jesus’ Mystical Body, inserting us into the Life, death, resurrection, and ascension of the only Son! This reality is there in the theology of Paul, and unpacked for us in the teaching of the saints and doctors. 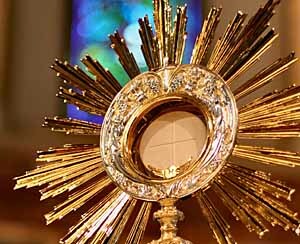 What I’d never recognized before though, was how it was contained in Jesus’ institution of the Eucharist. When we start to meditate on that Fifth Luminous Mystery, we naturally hear His words, “This is My Body …. This is My Blood of the covenant, which is poured out for many.” And in a moment of grace, we’re reminded where Jesus took His Body and Blood from — His Mother Mary. Jesus clothed Himself with her flesh, her blood, and offered Himself to the Father “in” them. That is the mystery of redemptive suffering that the Lord wants to continue in you and me — to clothe Himself with our very persons and lift our sufferings up into His own, making them part of His eternal offering to the Father (Heb.9:14). As with Mary, He requires our consent to bring about this supernatural reality, “I am the handmaid of the Lord; let it be to me according to your word” (Luke 1:38). We see Mary, fully engaged in this Mystery, there at the foot of her Son’s Cross. Which of us parents haven’t imagined looking up and seeing our own children hanging there in the sun — their bodies ripped, blood flowing down their limbs, suffocating under their own weight. It is the most monstrous suffering imaginable, but God allowed it into the life of His beloved Mary. Her Son was dying to redeem the world, and her heart was pierced right along with His (Jn.19:34; Lk.2:35). Jesus was suffering there before her eyes, in the flesh He took from her; but through the chords of grace He was suffering in and through her person, gazing up at Him, as well. Through it all, the Holy Spirit maintained Mary in her fiat , “let it be to me according to your word;” and Scripture tells us that He made her suffering fruitful for the Mystical Body, “[Mary,] a sword will pierce your own soul also, that the thoughts of many hearts may be revealed” (Lk.2:35). The mystery of redemptive suffering spoken of by Paul in Colossians 1:24 is graphically manifested by Mary at the Cross. I don’t see any romance in pain, and I don’t desire it; but part of reality is recognizing that God allows me to pass through it. It is not an end in itself, but a potentially powerful means: “For Jesus’ sake I have suffered the loss of all things, and count them as refuse, in order that I may gain Christ and be found in him…that I may know him and the power of his resurrection, and may share his sufferings, becoming like him in his death, that if possible I may attain the resurrection from the dead” (Phil.3:8-11). So I need to call out for the grace to unite my sufferings to those of Jesus, to allow Him to lift me up toward His Father, “This is My Body…This is My Blood.” I need to pray each day for the grace to persevere through suffering; Jesus told us the stakes are high, “Because wickedness is multiplied, most men’s love will grow cold. But he who endures to the end will be saved” (Matt.24:12-13).